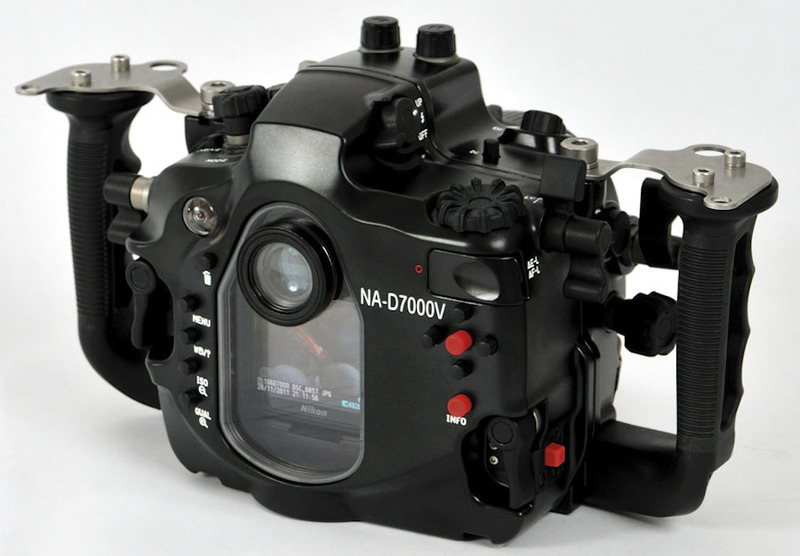 Nauticam released an updated version NA-D7000V of their NA-D7000 underwater housing for Nikon D7000. The new version (model Number: 17206) features enhanced control access and HDMI connection compatibility. The depth rating is 100m, the retail price will be $3300, shipping will start on January 1, 2012. Unveiled with great fanfare at the 2010 DEMA Show, the original NA-D7000 housing grew to be one Nauticam’s most successful offerings. 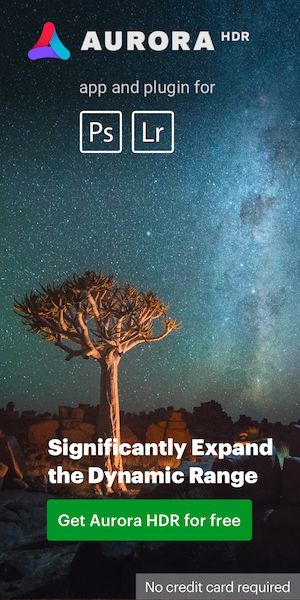 A little over one year later, Nauticam is proud to announce an update that includes significant ergonomic improvements and new accessory compatibility. The Nikon D7000 needs no introduction. The camera is already one of the leading underwater options and the best choice for Nikon DX users. The D7000 boasts an impressive number of advanced features at a very affordable price point. With its 16.2 MP CMOS sensor, 1080p HD video with manual exposure control, and 39-point AF system, the D7000 is an excellent choice for the advanced enthusiast. 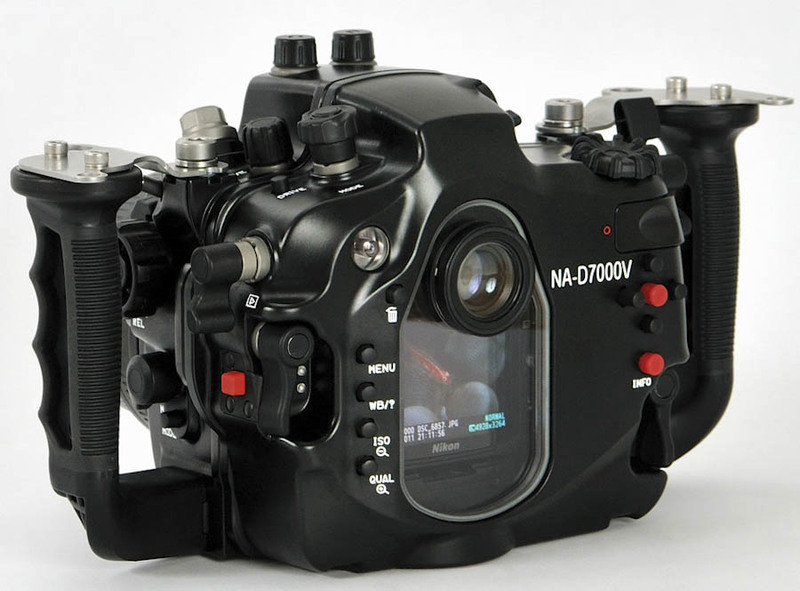 In keeping with Nauticam philosophy, the NA-D7000V housing continues to improve new products by building on previous innovations. 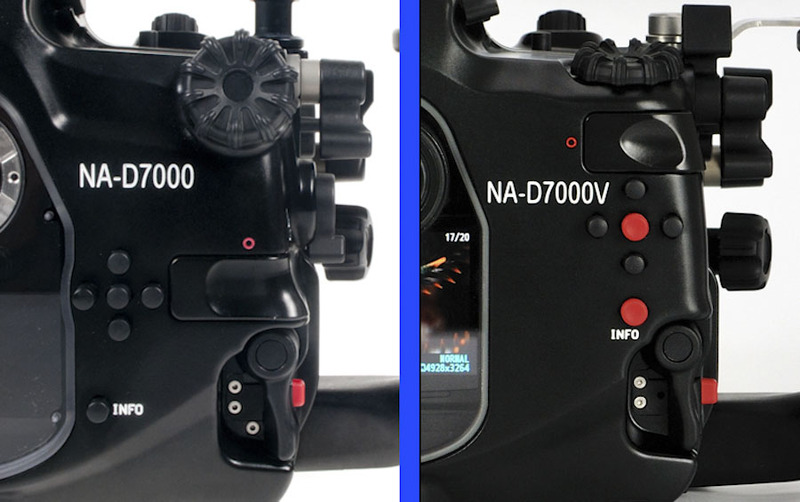 NA-D7000V inherits the outstanding ergonomics of its predecessor, and adds access to the multi-controller, “OK”, and “Info” buttons at the right grip. 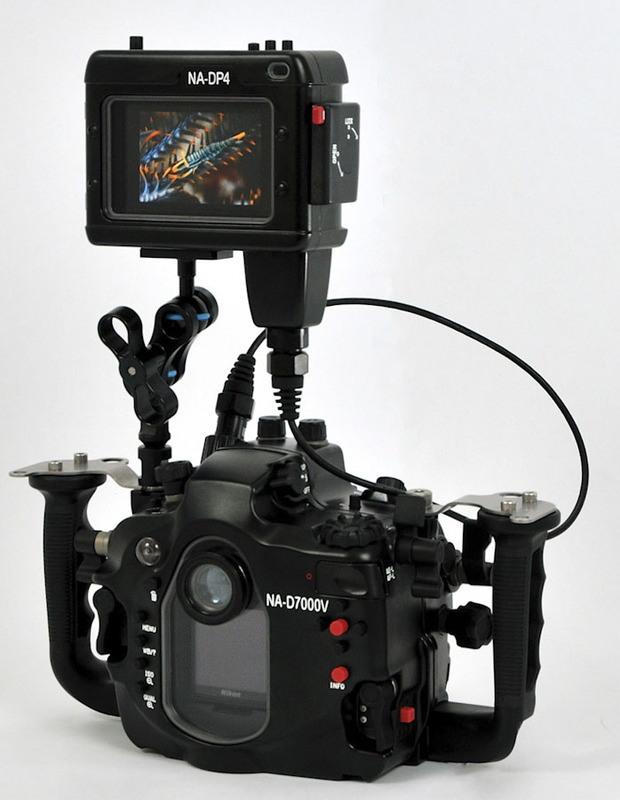 Now nearly every function on the D7000 can be controlled from the housing handles! A new lever to disengage the housing’s zoom and focus control makes camera loading with a lens attached easier than ever! While no control levels required presetting on previous housings, zoom or focus gears could occasionally snag on the control assembly. This new assembly eliminates inconvenience, and allows faster setup. Stainless steel housing handle brackets are included to provide additional security when heavy strobes or video lights are attached, and provide lanyard mounting points. This mechanical lever greatly enhances tactile feel of the half-press and full-press positions of the camera shutter release button, allowing precise focus control, and fewer accidental shutter actuations. Easy to use locking latches are simple to close with only minimal hand strength required, and are protected from accidental opening by a pushbutton lock. This new closure method is not only easier to operate, but reduces the overall size of the housing. 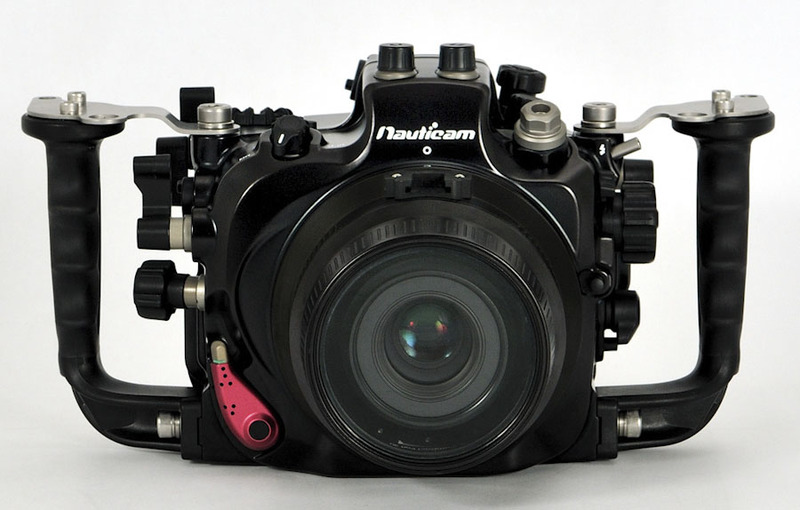 The acclaimed patented Nauticam Locking Port Release is incorporated into the NA-D7000V housing. Lens ports are inserted straight into the port mount, eliminating the twisting or threading actions that can extrude dry o-rings. Once seated, the large red port lock lever is engaged, securely locking the port in place. To remove a lens port, the silver unlock button is pressed, the port lock lever rotated to the outboard position, and the port is pulled straight out of the housing. Nauticam also features the industry’s only locking extension ring system as standard equipment, securely fixing large dome ports even when mounted with an extension ring. 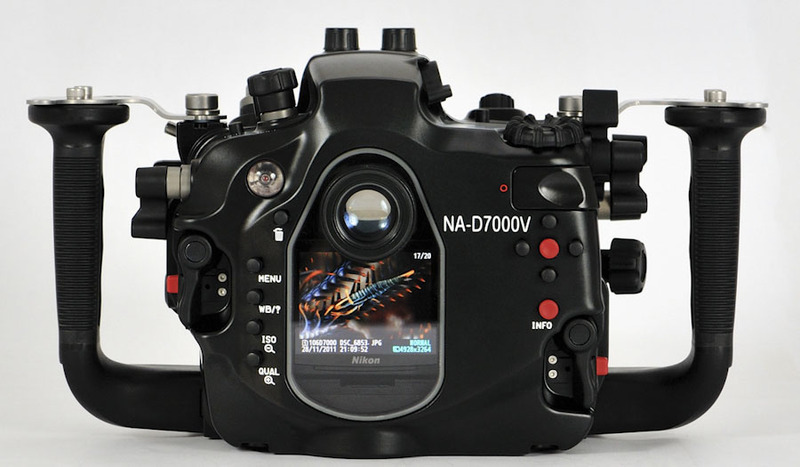 NA-D7000V is compatible with Nauticam SLR housing accessories, allowing use of an extensive line of lenses, ports, port adapters, lens gears, and viewfinders. Nauticam’s highly acclaimed optional 180º and 45º viewfinders provide a crystal clear life size view of the camera’s optical viewfinder through a diving mask. The patented external dioptric adjustment allows eye relief to be fine tuned in water. High quality optics eliminate distortion and keep color fringing to an absolute minimum. The edge-to-edge, magnified viewfinder image makes confirming fine focus and checking corner composition an absolute breeze. Nauticam offers a full range of port adapters allowing existing housing owners to use their current ports, reducing the cost of switching to a Nauticam housing. Port Adapters are available for Aquatica, Ikelite, Inon, Nexus M5, Nexus M6, Sea & Sea NX, Seacam, Subal Version 3, Subal Version 4, and Zillion lens ports. A variety of optically fired underwater strobes yield reliable, totally automatic flash exposures via fiber optic cables with Nauticam housings. Inon Z-240, D-2000, S-2000, Sea & Sea YS-110 Alpha, and YS-01 strobes provide automated lighting, precisely reproducing the camera’s onboard flash at a proportionally greater intensity. This system yields accurate TTL flash performance with no electrical sync cables to flood! Nikonos, Ikelite, and S6 style flash connectors are available as optional accessories for customers utilizing legacy electrically fired strobe systems. Nauticam uses a sophisticated over-mold process to produce extremely comfortable and secure rubberized ergonomic handgrips. Handles are available in two sizes to accommodate customers with different size hands, and spacers are available with the housing for cold-water divers. This entry was posted in Nikon D7000 and tagged Underwater housing for Nikon. Bookmark the permalink. Trackbacks are closed, but you can post a comment.